You can build applications for multiple target platforms, or using different compilers, debuggers or Qt versions. Kits define the tools, device type and other settings to use. By default, when you run the application, you automatically build and deploy it first. However, you can also perform each operation separately. To check that the application code can be compiled and linked for a device, you can build the project. 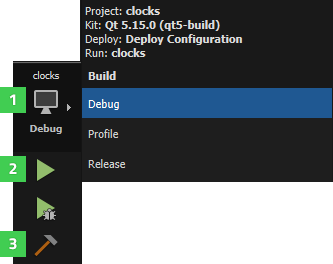 The build errors and warnings are displayed in the Issues output pane. More detailed information is displayed in the Compile Output pane. Click the Build and Run Kit Selector icon (1) or select Build > Open Build and Run Kit Selector to select the build and run kit. Choose Build > Build Project or press Ctrl+B. You can also select the Run button (2) to also deploy and run the application after building it. While the application is being built, the Build button changes to a Cancel Build button (3). To cancel the build, select the button or press Alt+Backspace. For more information on the options you have, see Specifying Build Settings. To quickly check the compile output for changes that you made in one file or subproject, you can use the Build menu commands to build a file or subproject. To remove all build artifacts, select Build > Clean All or Clean Project. To clean the build directory and then build the project, select Build > Rebuild All or Rebuild Project. To build and clean projects without dependencies, select the Build Without Dependencies, Rebuild Without Dependencies, and Clean Without Dependencies options in the context menu in the Projects view. To run qmake to generate new Makefiles, select Build > qmake.